Architecture entails more than drawing the layout of a house. Factors such as cultural and geographical context also come into play and are crucial in designing a project. For this reason houses situated in the Mediterranean all have their own unique architectural style and elements due to the geographical and cultural peculiarities of the region – perhaps that is what makes this style so unique and loved by so many. 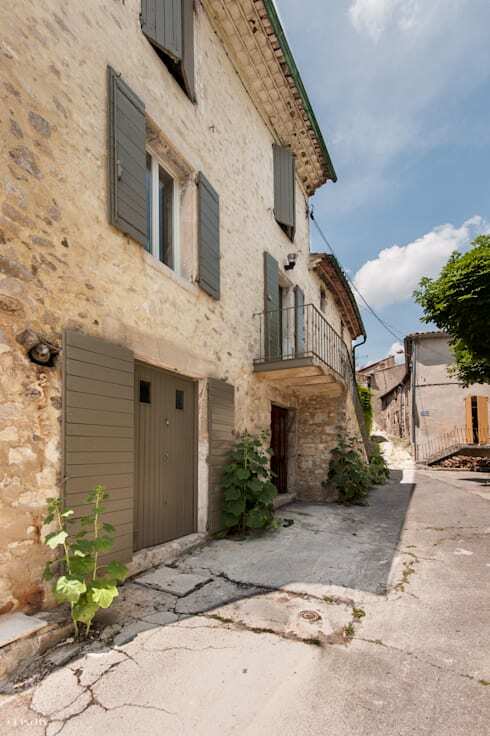 Today on homify 360° our setting is the spectacular countryside of Luberon in France. 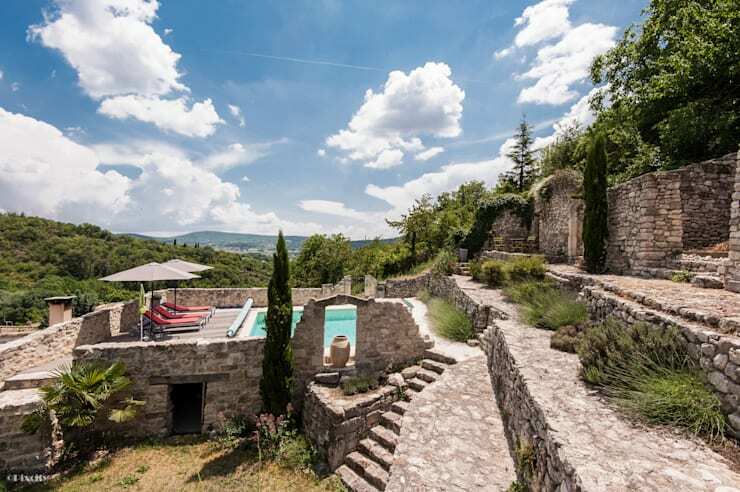 Known for its vineyards and orchards, perched hill-top villages and mountainous views, Luberon now has one more element to boast about – this rustic-style house with its Mediterranean uniqueness, touches of wild and unreserved colours and Provençal-style wooden furniture that brings refinement and comfort to its residents. Brought to us by French photographers Pixcity, we’ll delve into all the visual elements that make up this unique and noteworthy architectural beauty. So, get ready to touch down in this natural landscape of splendour and beauty and let’s discover a unique residence of spacious and welcoming style. A modern swimming and lounge area seemingly dropped from the sky onto a landscape of ancient stone ruins. Taking advantage of the rocky terrain and the exuberant nature of the Mediterranean landscape, the designers added a contemporary swimming area that delightfully contrasts with its surroundings. The mountains in the distance and the fresh green surroundings make the perfect neighbours – friendly, aesthetically pleasing and always welcome. Varying levels of stone floors, connected by characteristic stairs, add an otherworldly effect to the exterior and makes one wonder what type of decorations can be set up here when hosting a social event. To be perfectly honest the outside reveals nothing about the possible treasures waiting to be discovered on the inside. A tourist distracted by the local sights and sounds might innocently wander past this house, unable to distinguish it from the surrounding buildings. That is because its façade is a typical example of the Provençal style, marked by rough surfaces of stone and wooden frames (most often in olive green or lilac, which references its most famous local produce: olive and lavender) and completed by metal-railing balconies. Discreet, simple and stylistically rustic—exactly what we would expect to find here. The exterior stone walls continue on the inside but with a softer approach. Exposed wooden beams on the ceiling frame the cooking space. Expecting to find plain kitchen cabinets, we are instead treated to carefully carved wooden doors surrounded by splashes of golden yellow, affectionately surrounding this kitchen in a homely vibe. It feels warm and inviting and we’re imagining a busy grandmother lovingly preparing a French dish for the whole family on a Sunday afternoon. 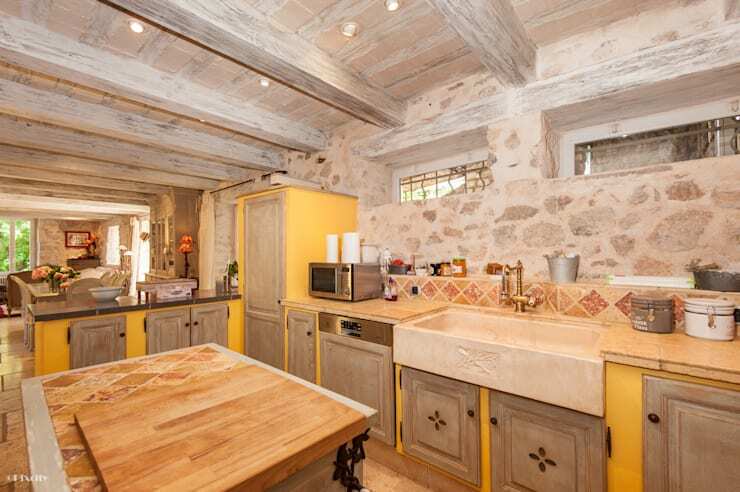 Don’t overlook that kitchen sink carved in stone, which adds a uniquely Mediterranean touch to the kitchen, making it feel more natural and blending in with its rustic surroundings. Spaciously designed rooms where the typical Mediterranean family, complete with busy youngsters, can live and socialise to their hearts’ desire. We approach the living room and the warm yellow of the kitchen gives way to a red palette. Here we find an upholstered sofa with light and friendly stripes, two comfortable Provençal armchairs, rustic wooden coffee table and a red and beige carpet breaking through the rural stone flooring. Neutral colours frame the living space and we are treated to varied textures of surfaces coated in stone and wood. And just when we think we’ve seen it all, we glimpse a wooden fireplace in the right corner, which we know will complement the decoration and charming interior on even the coldest winter evening. Connecting the kitchen and living room is the dining space, with that natural stone floor delightfully treating our eyes in all three areas. A carved wooden table with twisting legs, surrounded by Provençal-style chairs, ensures an elegant and refined atmosphere, perfect for every dish—from snacking on a sandwich to sitting down to a six-course meal. Just take a look at that wooden cabinet in colonial style, enhancing the ambience of the rustic décor in a most agreeable manner. Neutral colours dominate this area with a few spots of oranges and yellows twinkling here and there. C'est magnifique! Continuing from the living space, coated surfaces of stone lead us towards the bathroom. However, somehow along the way the stone floors have transformed into a warm wooden foundation. Here we find a slight modern touch in the form of an enclosed glass shower, pleasantly contrasting with the rustic surroundings. A hop from the shower and we find ourselves in front of a beige wooden cabinet, loose and mobile depending on where you want it to be located. The contemporary design of the shower extends onto the porcelain basin, soft and sleek in a crisp and clean white. When it came to picking a colour scheme the owners opted for a neutral tone – however, any palette (from cool blue towels to striking red shower mats) will fit in flawlessly with this cosy little area. Bedtime for the little ones can’t be presented in a more warm and delicate environment than this one. 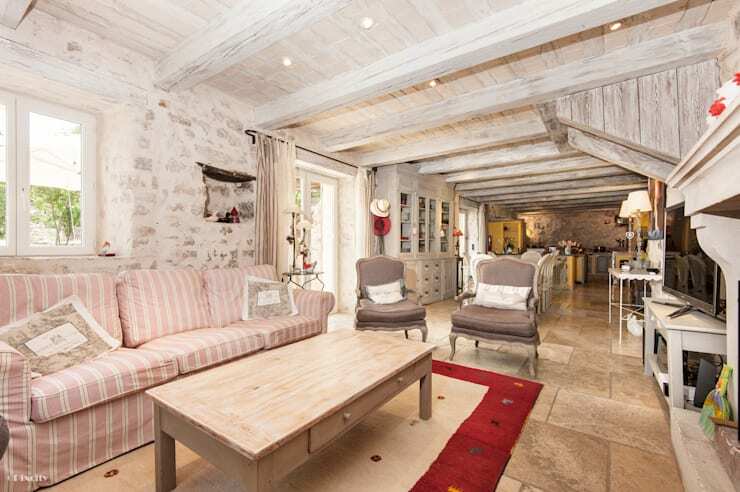 Warm wooden floors along with charming wooden furniture, ensure the Provençal style is carried through and links up with the soft, white hue of the linen. Hard stone walls and protruding roof beams are transformed into soft surfaces here, coated in vibrant colours of lovely lavender and youthful olive green. This bestows a certain identity on the environment and ensures a sweet liveliness to the bedroom, making it perfect for sweet dreams. For other ideas on bedrooms when it comes to youngsters, see Creative Rooms for Children. Neutral colours greet us in the bedroom, which is perfect for a room as intimate as this one. The grey wall against the bed offsets lovingly with the pale stones and warm wooden floors, creating a cherished and cosy environment. As in the child’s bedroom, wooden furniture has been used, also in a soft palette that’ll no doubt aid restful slumber. White framed images above the bed add a touch of personality and create a transparent headboard for the bed. Soft white linen and drapes complement the rest of the neutral palette and neatly completes the elegance and delicacy of the room décor. We leave the soft and delicate colour scheme behind as we enter the master bathroom. 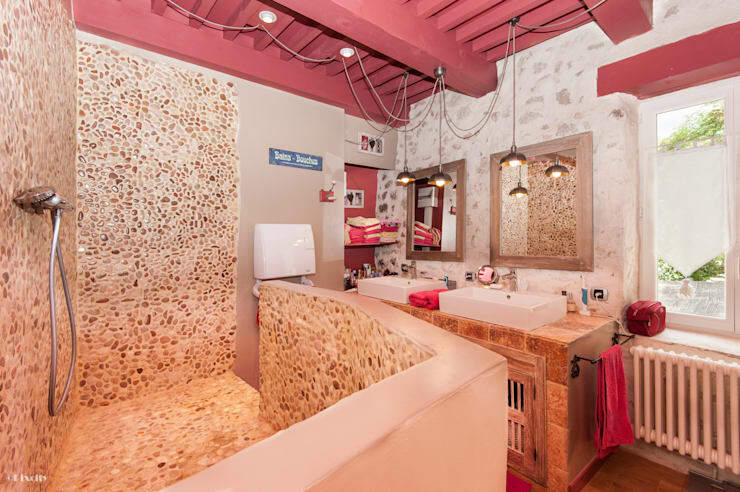 The wooden ceiling is decked in a soft yet vibrant pink, which echoes in the top bonnet of the window as well as the towel décor. We again meet up with the rustic style, this time embodied in the pebble surface of the shower, giving it a natural and care-free attitude. The rustic fashion continues into the stone cabinets and wooden-framed mirrors, separated by two modern square basins of sleek porcelain. Contemporary lighting in the form of pendant luminaries completes the delicate modern touches in this room of stone and pebble. Gazing at the front side of the house from the street provided absolutely no hint about the breathtaking scenery that is hidden at the back of the residence. Here our eyes revel in rocky plateaus, stone walls, lush vegetation and soft sky above. 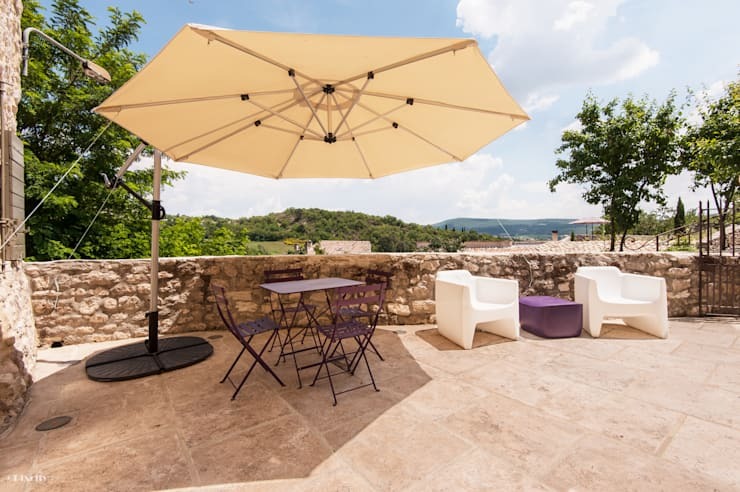 Stone floors will provide a strong foundation to anybody wishing to stand here (or take a seat on one of the white, modern exterior chairs) and take in a faint glimpse of the mountains on the horizon. Speaking of terraces… why not feast your eyes on some more visual inspiration when it comes to balconies, verandas and terraces? Here is where hard stone meets lush flora, where soft cool waters mirror the breezy sky, and where soft pink loungers add a modern touch to the rustic environment. 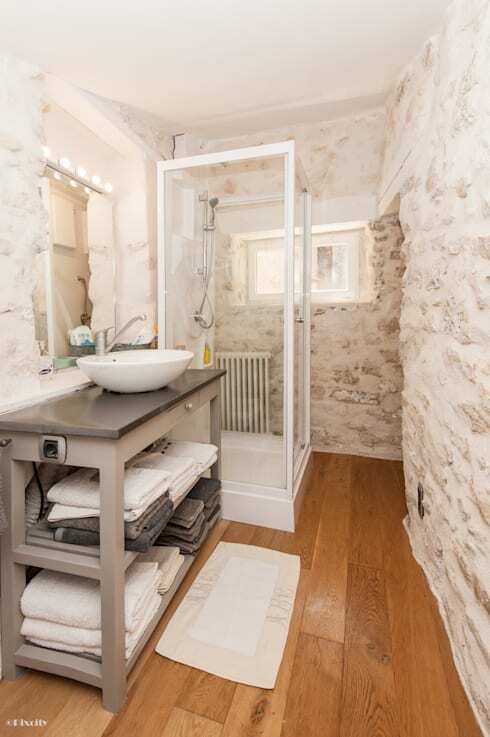 Here is where you can relax and cool off in contemporary style, only a few feet away from a rustic residence that is an enchanting combination of the geography and culture of Provence. A wooden deck and umbrellas complete this prime spot intended for comfort and pleasure, which, together with the tranquil environment, is the perfect opportunity and location for daydreaming and sun tanning.